Have you ever seen the signs in front of businesses or peoples houses advertising or campaigning for something? Ever wonder where they get those custom signs, and if so, did you think they were expensive? Well, I can answer that for you. They are NOT expensive, if you know the best place to get them! Recently, I came across a company called Signs On The Cheap. 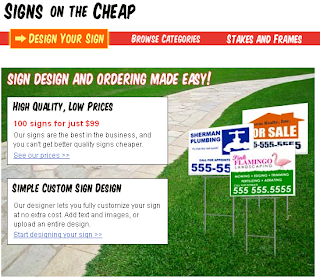 They offer all different types of signs at high quality that you can afford! Photo property of Signsonthecheap.com used for demonstrative purposes only. No copyright infringement intended. I must say, I am incredibly impressed with the quality of these products. I have nothing but great things to say about this company. The entire process of getting a personalized photo on canvas was a breeze! Whether you are a business person, politician, homeowner, real estate agent or someone looking for a personalized photo canvas, look no further! These make great gifts too and with the holidays coming up, it's a great way to get a gift for that special someone. A gift that they have never gotten before! Whatever your needs, this company comes highly recommended by me! One lucky reader is going to win a gift card of their own so that he/she can choose their winning item. Thanks for the chance to win! Have a good day! I think I would choose a canvas photo!